Boston Academy of English is a renowned language school with a mission to drive personal growth in both students of English as a foreign language and teaching English as a foreign language through high-quality, interactive classes in a stimulating and supportive environment. Global education specialist Cambridge Education Group has announced the acquisition of Boston Academy of English, completing its international portfolio presence in the city. Boston Academy of English offers a prime downtown location, premium facilities, and a dedicated student residence located only 25 minutes away. The School will be integrated into the Stafford House School of English group, which has over 60 years’ experience of providing international students with English language courses in the UK. The acquisition will complement the current Stafford House portfolio of UK schools in London, Brighton and Canterbury. 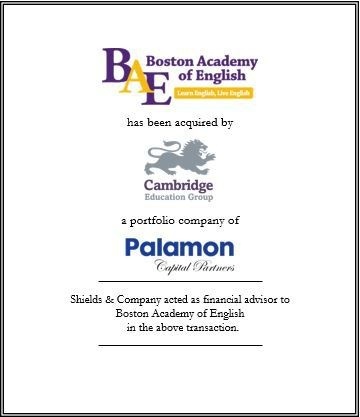 Shields & Co. represented and advised Boston Academy of English in the transaction.